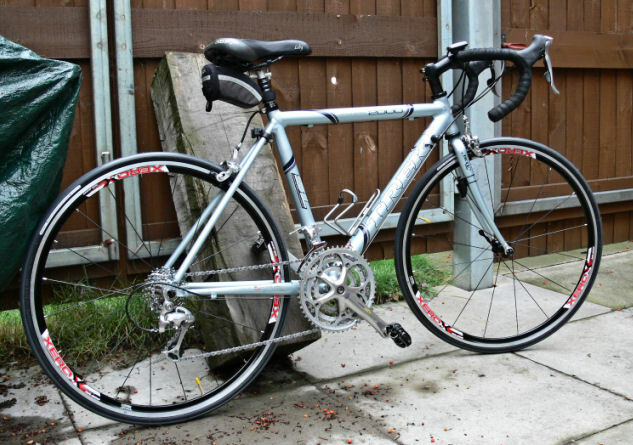 After having a heavy old steel MTB, and getting back into cycling using that machine, I was finally convinced in September 2004 to purchase a proper "road" bike. I was sceptical about the thin tyres, what seemed to be a very hard saddle and dropped handlebars, but I need not have been - I took to it like a duck to water. 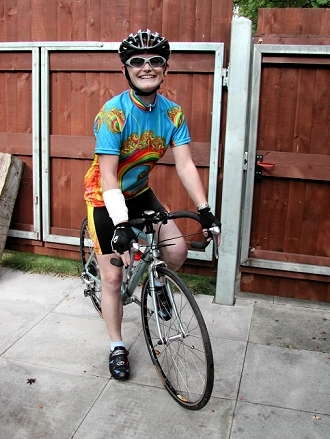 It made a massive difference to my riding almost straight away - it was much lighter than anything I'd ridden before, and I found I could get up hills in a much higher gear, meaning that Stephen had to try a bit harder to leave me behind! 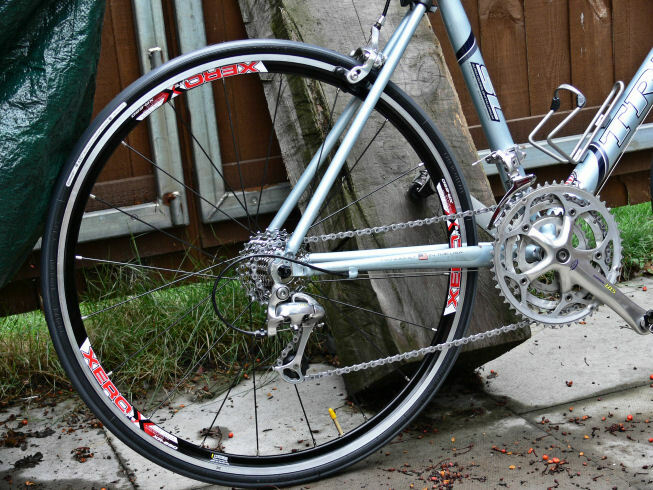 This bike came equipped with Shimano 105/Tiagra kit, and rather heavy Matrix wheels, so in the Summer of 2006, with over 2500 miles on the clock, I decided to upgrade with Xero wheels, a 105 front derailleur and Ultegra rear cassette and chain. 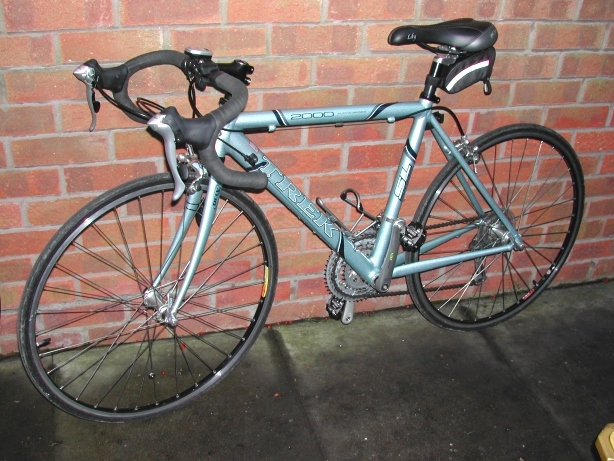 This made quite a difference again, and this bike is now my winter training bike, the bike I'd go to the shops or station on, and the bike I use on the turbo trainer. The bike is very well suited to my height, but I am not over-keen on the 650c wheels, which limit my choice of tyres, and don't look quite so good as larger wheels. They roll well, but I prefer my two bicycles with 700c wheels now I have them. Getting ready for a ride on my Trek 2000 - September 2005. I was ill and on IV antibiotics as you can see from the IV line and bandage on my right arm. 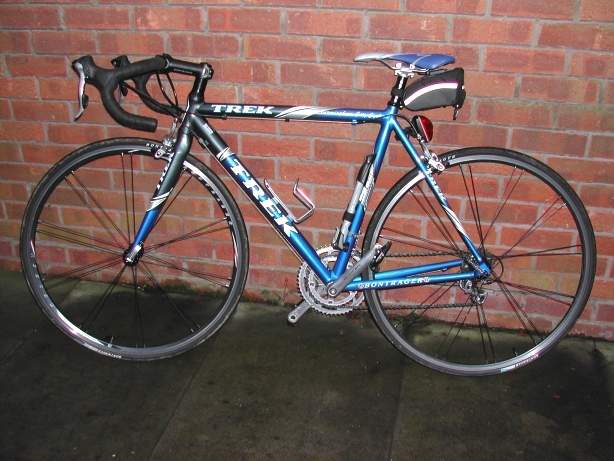 After my heavy old hybrid mountain bike, this Trek 2000 WSD was a revelation. Very light, sharp and really easy to ride. Our rides often look like the Trek owner's club outing - Stephen bought a Trek 1400 in 2004 as well - it is blue, and it is the first new bike he has ever owned (being the youngest of four brothers, he rarely got anything new, and usually inherited a load of parts rather than complete bikes from his older brothers).